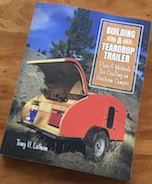 Teardrops n Tiny Travel Trailers • View topic - Uses for "RevolutionPly"? The price is nice but I just came from a local lumberyard where they have 1/4" birch for $17 a 4x8 sheet. Lowe's and HD have it for about $25 a sheet. Well, it's called 1/4" but is really .203" which seems pretty close to the 5mm of this RevolutionPly. I have not found 1/8" birch anywhere local. Sunset Hardwoods in LR has 1/8 5x5 sheets. Have you tried Hogans? They might have it but not very friendly service. Might try Plunkett Dist. I will check them out, thank you. I have not heard of them. The birch I was just referring to was from Kaufman's. They have Russian birch. A lot better than Chinese birch. Ask your local lumberyard if they can order 1/8" Baltic for you. Mine doesn't flinch. It's how they stay competitive with the box stores and their cheap stuff. Salmon, Idaho has one lumber yard that serves about 3,000 peeps. We're three hours from the nearest box store. This yard orders specialty plywoods every week. I think it's the norm for lumber yards. We had a lumbar yard like that when I moved to New Mexico about twelve years ago. I used to order vigas and lattias (big logs and little logs for us gringos) from them to build rustic furniture. About three years ago the owner retired, complaining about the quality of lumber they got from their suppliers, and the lumbar yard was sold to a chain that operates all over rural New Mexico. No luck getting them to order anything nowadays. I hope that isn't indicative of a nationwide trend. Luckily, we do have a hardwood lumber yard in Albuquerque that carries Baltic birch, but they wouldn't order Integraply (or, I presume anything else they don't already carry). 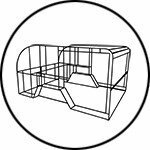 I tried it recently, and kept it on some parts, like skinning the interior of cabinets and what not, but decided against it for anything else. The thickness and weight of it is quite nice, and doesn't look too bad with stained applied. What I really haven't liked about it is how it relaxed so easily. This could be a benefit in some cases, but when you're not looking to have any curvature, it definitely needs supports. I had a 45"x 17" piece that was lying horizontally, supported at both ends and in the very center. 3-4 days later and it had sagged roughly 1/8th of an inch in the unsupported areas. My second dislike is that it's surfaces aren't flat. If anyone plans to have a semigloss, or glossy finish, wether it be painted or stained, you will see indents in the veneer. They appear as areas that were/have been under a lot of weight, and never regained it's form. In the pieces I had, 1/2" indents running the full 4" width of the board were very common. In another there was an indented area that covered about 80sq inches or so, as if a bag of concrete was sitting on the outer edge of the board. The tiny camper stays outside all the time and spent last winter without a tarp. We are camping next week. I also recently discovered Revolution Ply. I had forgotten about it then came across some at a Lowe's store. It looked like just what I need for the exterior of my tiny travel trailer. About 5MM thick, uniform and priced at about $16 a panel. I don't see anywhere on the manufacturers website where it is expressly forbidden to use outdoors, but it was labeled that way at the store. Sounds to me like the experience with builders here regarding it holding up to moisture has been good. I don't like the idea that the surface may appear indented in some areas. Not sure if you can see this in the store and avoid those panels. It is always nice to be able to get real world opinions on this forum! While you're there, see if they have any 1/4" underlayment plywood. The stuff my little yard here stocks has no voids, a better A-side and a few dollars cheaper than AC. (But it's 7/32"). What are you guys doing to bend the 5mm Revolutionply? Patrick Star wrote: What are you guys doing to bend the 5mm Revolutionply? I plan on doing exactly that today. However I will chop off a small piece from a panel and toss it in a 5 gallon bucket since even if I had a pool it would be very solid at -11F overnight (with koisicles)..... I want to see for myself what this stuff does when it gets wet. I hope to possibly use this as the outside skin of my build and encapsulating it in thinned epoxy for waterproofing. There have been various reports as to its weather resistance; I will spend $15.88 to find out. Sounds like you are more interested in its bending properties. Some posts mentioned that it was pretty stiff and even hard to get a screw started. Not sure this is what you want to do a small radius bend. After pouring boiling water over a test scrap and then a couple days submerged in water, it totally failed the waterproof test. Picures below. I am presently soaking a larger piece and expect a similar result. I am sad. I wanted it to work. Encapsulating it in epoxy might be good enough to allow its use, and I will test that as well, but I am probably not going to risk using it. Ho hum!